Just like with a previous review about the definition of a catch, don’t ask me to define what is or isn’t pass interference anymore. 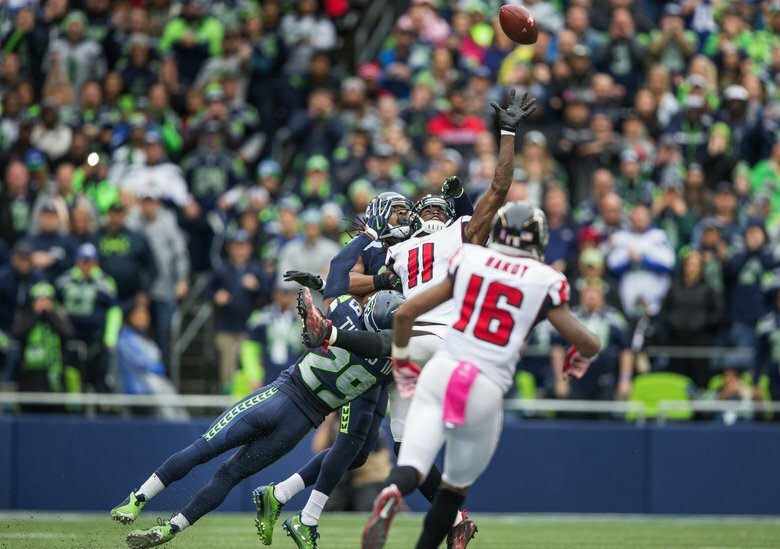 In the photo above you can clearly see that Seahawks CB Richard Sherman is holding back the right arm of Falcons WR Julio Jones. Only one arm can be extended to try to catch the incoming football. This was late in the 4th quarter with over a minute to go. If Julio had made the one-handed catch, we wouldn’t be having this discussion. Since he didn’t on the 4th down play, we’re still waiting for the yellow bean bag to fly. Don’t ask me why it wasn’t thrown. I don’t know what will result in pass interference anymore. Wide receivers do get the wrap that they are prima donnas and whine way too much about not getting the ball thrown to them. I will be the first one to call them on it. 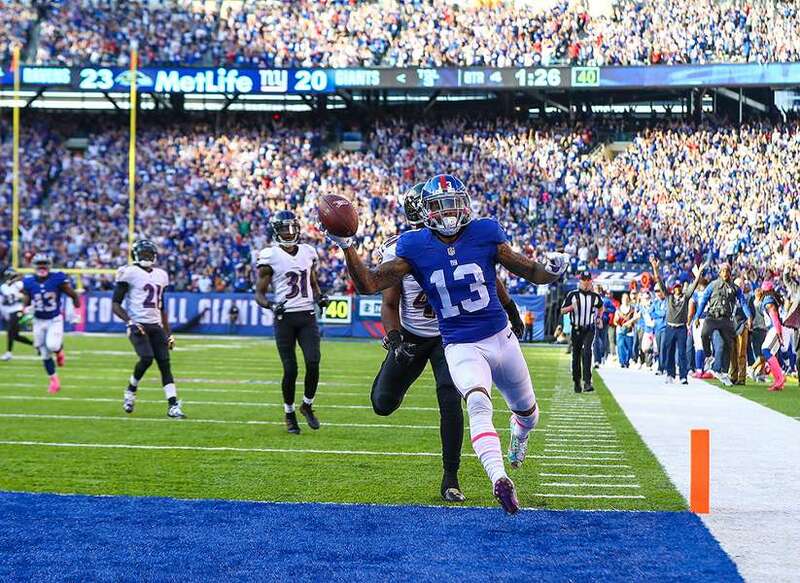 When I watch Odell Beckham, I don’t get that feeling about him. He hasn’t complained about not getting the ball thrown to him. It’s mainly from the attention he gets from the defense and the reaction of him getting penalized for unsportsmanlike conduct. It was all gloom and doom in New York with Beckham for a couple weeks, but that changed pretty quickly this past Sunday. The only problem I have is that his penalties do cost his team and could have cost them a win with him taking off his helmet after his second touchdown catch. Ease up on the penalties and just have fun Odell. The NFL would have you believe that everything is fine. The ratings are still high, the fans are still flocking to the stadiums and they are looking at another year of record profits. The biggest farce about all that is the television ratings. Now it could be that not everyone is watching football on the old living room TV. There are so many devices now to stream a live football game it’s insane. However, there is a problem that directly affects them with the down ratings. The product on the field is terrible. Most of the primetime games this year have been awful. This includes Thursday, Sunday and Monday night. The referees have been subpar at best, i.e the first topic above about pass interference. And frankly it’s just not the same watching a game anymore. To explain briefly, I can’t remember a time that I’d rather watch a preseason basketball game than a Sunday night regular season football game. That happened this past weekend. Even though the game ended with a comeback victory, both teams were terrible. They were both unwatchable. I only watched because this is what I love to do. The NFL has a huge problem if people like me are starting to think twice about watching a regular season game. Could the same happen for a playoff game? What about those so-so football fans that do have better things to do on a Sunday night? Good luck bringing those fans to the television screen. This entry was posted in Football and tagged Colts, Falcons, Football, Giants, NFL, Seahawks, Texans, Weekly Review.